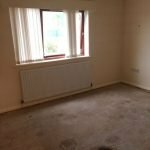 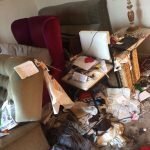 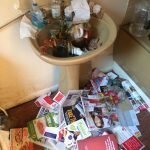 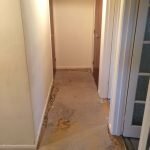 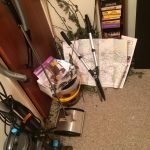 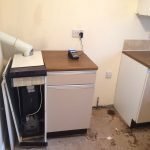 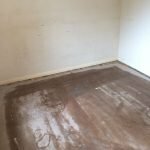 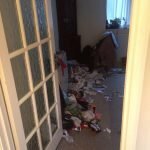 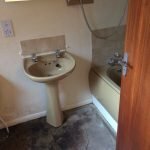 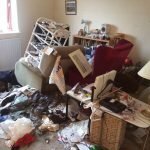 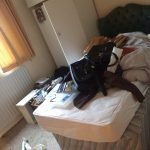 House Clearance Service In Southwell Kirkby-in-Ashfield Mansfield. 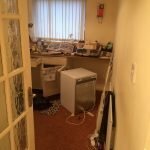 As well as clearing the usual furniture these small items will also need clearing – A brand new green Joseph Joseph chopping board, A Rockworth Powerstack rechargeable electric screw driver kit, A vintage style American diner blue and chrome napkin dispenser, A red and black North Face wash bag, A set of four brand new Laura Ashley measuring cups, A set of decorative nativity figures in original display box, A Kenwood Discovery ST50 Dual voltage travel iron. 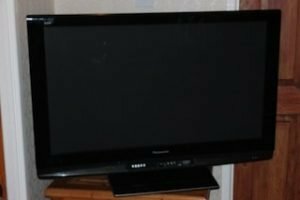 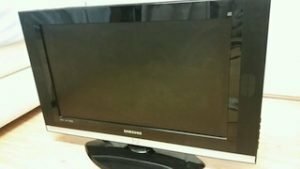 A black Panasonic Viera TH42PZ82BA 42 inch full HD flat screen television. 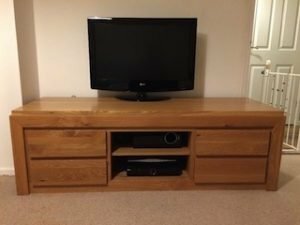 A large solid oak Next sideboard, together with a black LG 32 inch flat screen television. 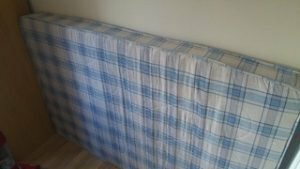 A blue and white checkered upholstered single mattress. 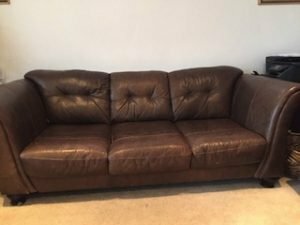 A three seater high back sofa on solid oak feet, upholstered with chocolate brown authentic leather. 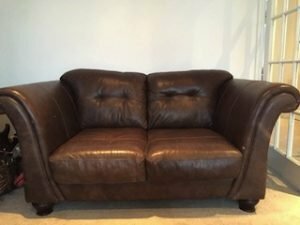 A two seater high back sofa on solid oak feet, upholstered with chocolate brown authentic leather. 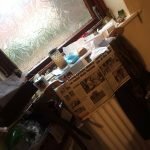 A painted white solid pine tall standing bedroom chest of drawers, having two small over five large drawers, each with crystal knobs. 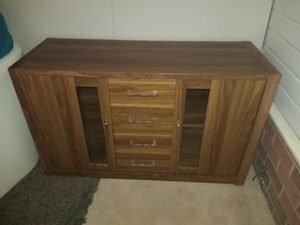 A small solid wood bedroom chest of three drawers. 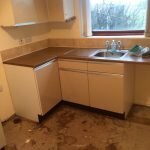 A large solid oak and glass Next sideboard, having a single cupboard to either side of four central drawers, with chrome handles. 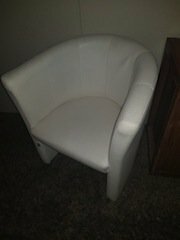 A small children’s bedroom tub chair, upholstered with white faux leather. 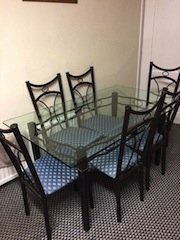 A black cast iron and glass dining table, together with six matching dining chairs, upholstered to the seats with blue patterned fabric. 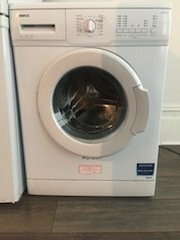 A white Beko 8kg 1200 spin under counter washing machine. 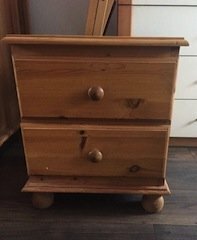 A small solid pine bedside chest of drawers, raised on four ball feet. 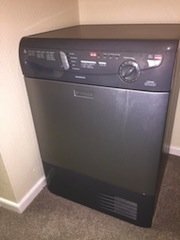 A silver Hotpoint 9kg under counter condenser tumble dryer. 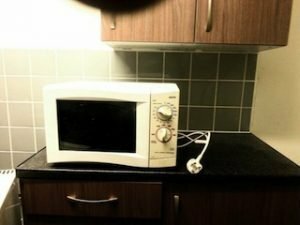 A white Sanyo 600w microwave oven.